What do our DPTs do after hours? We brought Dr. Jake Wendland (our DPT at the Fergus location) down to Alex the other night to catch up and have some Wings. I had no intention (nor did he) of filming anything, but midway through the “assessment/treatment” I realized I should give an insider look at what we do! What’s a Cuboid? And what can go wrong with it during/after an inversion ankle sprain? 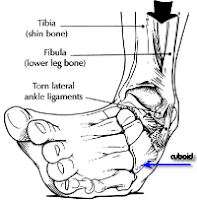 Above you can see how the cuboid bone in the foot can undergo some trauma and even be slightly out of place or subluxated when someone “rolls” their ankle. One of the easiest, quickest fixes is a “Cuboid whip” where the Doctor of Physical Therapy will do a thrust manipulation to restore normal mechanics at the foot and ankle. Obviously there’s more treatment available for ankle sprains, but this is commonly missed and thus not effectively treated.